Could it be? Yes it could. School testing seems to have turned a critical corner in New York. Testing is going beyond the No.2 pencil darkened bubbles. Teacher evaluation is now expanding to domains not suited to multiple choice or True/False standardized tests. Evaluations will now include actual classroom observations and assessment of meaningful classroom work (ex. research papers.) While no one is suggesting shredding those bubble sheets once and for all, this is progress. This expanded evaluation including areas such as Kindergarten, art, gym and remedial curriculum forces us to ask valuable questions regarding intent and outcomes. Keeping the budget in mind (which one must always do in real life) we now ask ourselves what gym is really all about. Do we feel that an integral part of a child’s K-12 education should be mastering the rules of team sports? Should gym be focused instead on combating inactive lifestyle and obesity? Is gym the euphemism for all things physical and be the source of nutrition, health and puberty education? We can only form meaningful evaluation when we decide why it is we’re doing what we’re doing. The same is true for art in schools. If we decide that the arts (in all forms) supports and expands all areas of K-12 education than art evaluation must be integrated into all evaluations. If art class means making projects than the mastery of those projects should be evaluated. These examples (gym and art) might initiate conversation about teaching skills versus innate talent. And that is good. For what is any achievement (academic or otherwise) than an amalgamation of innate talent and learned skill? A talent with language, math, abstraction, memorization or analytical thinking is at the core of certain classroom achievements. 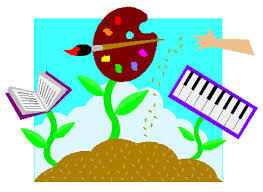 Having a visual/spatial, physical or musical gift is at the core of (what’s often considered) extra-curricular classes. Which begs the question why? If we believe in (Howard Gardner’s) Multiple Intelligences* (which by the spate of bumper stickers out there, we do) than why shouldn’t all areas of intelligence be equally nurtured and valued? If we believe that the role of public K-12 education is to prepare our children for their place in the world, our focus should be less about specific subjects and more about learning. There are countries that are leaps and bounds ahead of the U.S. in science, technology and math education and that makes some people nervous. The truth is that there will always be learners who are drawn to science and math and technology can be taught (as anyone who has ever transitioned from a walkman to an iPod can attest.) The role of public education is not to compete with other countries’ strengths but to cultivate the strengths of its own students. Curriculum should not be reactionary and teaching approaches should be designed for the benefit of the learner. Creating critical thinkers, cultivating a love of learning, and providing a well-rounded education will ready graduates for their place in the world.